BOND: Revisiting MOONRAKER | Warped Factor - Words in the Key of Geek. Matthew Kresal breaks up an encounter with a pet python to revisit Moonraker. With the success of the The Spy Who Loved Me in the summer of 1977, producer Albert R. Broccoli, director Lewis Gilbert, executive producer Michael G. Wilson, and screenwriter Christopher Wood began work on the next James Bond film, For Your Eyes Only. 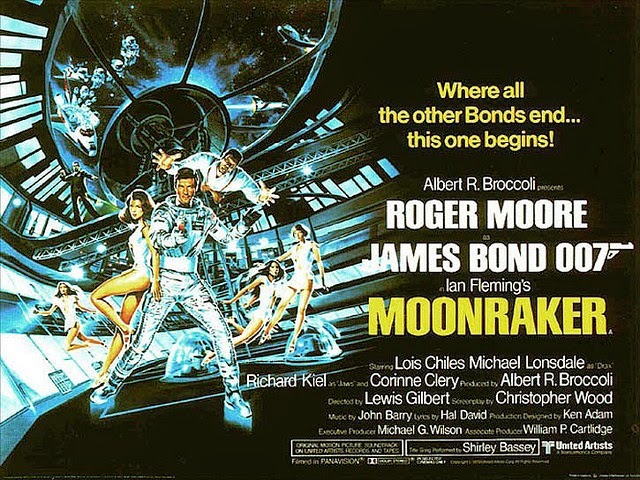 But with the success of Star Wars that same summer, a decision was made to send 007 into outer space with an adaptation of Ian Fleming's third novel, Moonraker. Although Broccoli insisted that Moonraker would be "science fact, not science fiction”, Moonraker turned into one of the biggest missteps in the history of the series, despite what it did at the box-office. Roger Moore's performance in this film is filled with his strongest attribute: humor. Throughout Moonraker, Moore is spitting out one liners at every possible opportunity. This leaves Moore in sleepwalking mode: he simply seems to show up and deliver his line, doing little else in between. Only once in the film does Moore show any vulnerability and that's in the most effective sequence: the out of control centrifuge scene. He is battered, lucky to be alive, and suspicious of everyone at Drax's plant. Because of the film's lack of character depth, and a focus on humor, action, and special effects, it ruins the film's main character and what should be the focus of the film. The lack of character depth continues on the film's leading lady, Holly Goodhead. Her introduction at the plant and her actions before, during, and after the centrifuge sequence show her to be a mysterious and possibly threatening figure. But from the point that Bond meets her in Venice till the end of the film, Holly loses all of those attributes she had previously and instead becomes little more than an Americanized take on Anya from the previous movie. That is minus the interesting character development that Anya was given. While intelligently performed by Lois Chiles, the writing makes Holly Goodhead one of the most forgettable Bond Girls of the series. Of all the main characters, perhaps the worst of all is the villain, Hugo Drax. He is an aristocrat held in high regard by the entire world, a man who stands (or rather sits) back and issues orders, and delivers some of the worst written lines in the entire series. Michael Lonsdale is a fine actor but this badly written role is only further ruined by Lonsdale's low key style of acting. Drax has no menace at all and as a threat is laughable. The supporting cast is of middling quality. Leading it is Jaws who is reduced from the menacing henchman seen in the previous film to a level that leaves him only behind J.W. Pepper in terms of cringe worthy comic relief. The film's best character is Drax's assistant Corinne Dufour, who comes across better in her few moments on screen than any other characters in the entire film. In fact, her death at the teeth of Drax's dogs is an incredibly well done scene that stands in stark contrast with the rest of Moonraker. The film wastes two characters in the form of Drax's servant/henchman Chang and Bond’s Rio contact Manuela, a character who shows up in Bond’s hotel suite long enough to sleep with him before getting threatened by Jaws in a Rio alleyway and disappear out of the film. As for the staff at MI6, Bernard Lee gives his best performance as M in a decade, Desmond Llewelyn gives a good performance as Q and gives the film's best line and Miss Moneypenny is once again given a massively downgraded part. It’s a less than stellar supporting cast all around. The action sequences are a mixed bag as well. Take the mid-air fight in the teaser for example. It is one of the best teaser sequences to appear in any Bond film with its combination of well filmed and performed action and John Barry’s score. Yet at the end of the sequence it is ruined by the appearance of Jaws flapping his arms trying to land on a circus tent. The boat chase in Venice is rather bland and stoops down to the boat chase a couple of films back in The Man With The Golden Gun, even copying it at times. If indeed the Bond films as a series bear no resemblance to reality most of time, then this is one of the cases where it stooped lower than the deepest spot on the ocean floor. The boat chase in the Amazon is a great action sequence and is one of the easiest to watch simply due to it being played straight until the very end. Even the battle on board the space station is lacking what made similar sequences in other films so memorable. There are two things which really hurt the film, both found in the script. The first is that Moonraker simply rehashes the plot of The Spy Who Loved Me, just changing the character’s names and the obsession of the villain from the ocean to outer space. It makes the film predictable to the nth degree. Yet that isn’t the biggest problem. That would be the sci-fi element of the film, this is what ruins it. As a fan of science fiction that seems weird to say, but I feel safe in saying it has no place in a James Bond film. Or rather it has no place being done in such a nonsensical a manner as it is done here. The whole plot of stealing a fully fueled space shuttle off a 747, and the space station that can't be seen on radar are among the dumbest ideas to ever appear in a Bond film. The battle sequence and the finale sequence, as I discussed above, are all you need to realize that while Broccoli was aiming for "science fact, not science fiction" the film is sci-fi. In fact, just look at the film's last action sequence. It has Bond trying to blow up a globe containing poison with a laser. Sound oddly familiar? For me, it is proof that this film was doing its best to copy Star Wars, as this scene is just like the famous finale of that film minus Sir Alec Guinness telling Roger Moore to "Use the force." If indeed the Bond films as a series bear no resemblance to reality most of time, then this is one of the cases where the series threw logic overboard. If there is a bright spot in this film it is John Barry's score. The score proper is never played for laughs and helps to add some much-needed tension to the film, particularly during Bond's sneaking around Drax's plant in Venice. The action music makes some of the series best use of the James Bond Theme and the romantic cues are very fitting. The score though just doesn't quite seem up to par with Barry's other scores, but it does elevate Moonraker up a bit. That might simply be because there is also the use of the Close Encounters Of The Third Kind theme, The Magnificent Seven theme, and other music, which is cringe worthy at best and proof of the emphasis on humor. Barry’s scrore might be straight but it is undermined by what is added onto it. 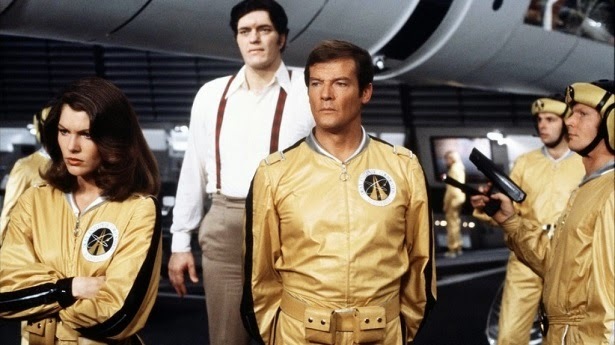 Even with a decent supporting cast and a good score, Moonraker is hampered down by bad main characters, mixed action sequences, bad humor, and overly emphasized sci-fi elements. Moonraker tapped into the taste for science fiction that Star Wars had reawakened but in doing so did what Bond had always tried to avoid: to imitate its imitators (or in this case imitate another major event film). As a result, Bond left the 1970s as he came into it: filled with bad jokes and nonsensical in terms of plot.